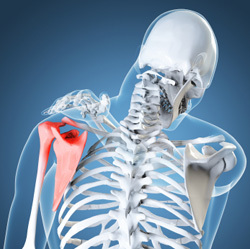 We often find in our office that shoulder pain is directly related to the rotator cuff. Adhesions and fibrosis can develop in the shoulder muscles and limit range of motion. When you try to force the range of motion like reaching above your head for example, you create impingement of the rotator cuff and thus inflammation.